By the time that Robert Walker came to be tenant of Mains of Portlethen and Hillside there had already been five generations of his family working the lands on or around Portlethen before him. It was Robert Walker, who first came to our attention in the early part of the 19th century and began to be involved in local matters and it wasn’t long before he was the face of authority around the community in the district of Portlethen. At this time he was acting as the factor for Sir William Johnstone and in later years he would hold the same role for the Gammell family. Johnstone and the Gammell’s did not stay on their estate at Portlethen and would have been little known by local people and Robert Walker would have slipped easily into the role of laird in the landowners continued absence. Robert Walker was not just a farmer and he had many roles in business and around the local community. Perhaps he is most famous for being one of the earliest breeders of Aberdeenshire polled cattle and the first of these cattle were on his farm, at the “Mains of Portlethen” in 1818, although it was perhaps a little bit later before Walker became involved in the improvement of this herd given as he was only sixteen years of age at this time. In fact there are records of these polled cattle dating back to 1784, the oldest animal whose date of birth was recorded in a herd book on this date was the bull Colonel 145, whose sire was a bull bred at Portlethen. From 1818 onwards a private register and a herd book was maintained at Portlethen and from then more accurate historical records were available in respect to the famous Portlethen herd. Few men did more solid work in the improvement of this breed than Walker. For over fifty years he was considered to be one of the leading breeders of polled cattle in the country and he built up and brought to a high state of perfection a choice herd of eighty to one hundred head of cattle. 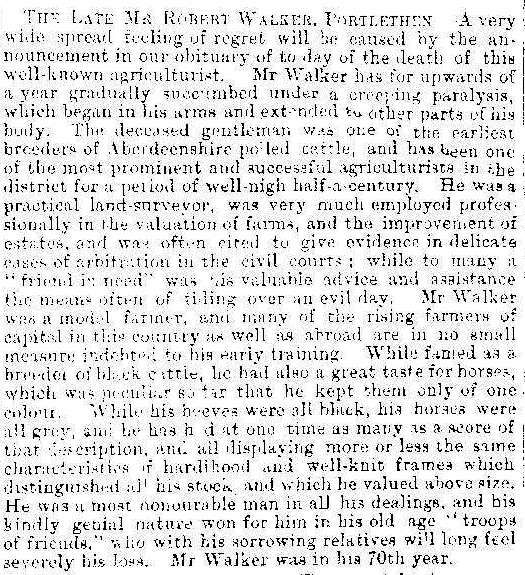 The main portion of his heard was dispersed after Walker’s death but his son retained a few cattle and the family reputation for rearing fine beasts continued for as long as the farm remained in Walker family hands. Robert Walker reared some celebrated bulls, most noticeably “Fox Maule” and “Banks of the Dee”, both of which were distinguished show yard animals. Of Walker’s great success in the show yard, William McCombie in his Cattle and Cattle Breeders stated “It would be endless to attempt to sum up his victories, local, national and international; they are spread over such a large surface. In one season the descendants of “Banks of the Dee” gained no fewer than seven first prizes and one second prize. Interestingly, whilst Walker was famed as a breeder of black cattle, he also had a great taste for horses, which was peculiar in that he kept them of only one colour; whilst his cattle were all black, his horses were always grey. At one time he had as many as a score of these grey horses, each displaying more or less the same characteristic of hardiness and with well knit frames which distinguished all his all his stock, and which he valued over size. Robert Walker was one of the most prominent and successful agriculturists in the district for over half a century. 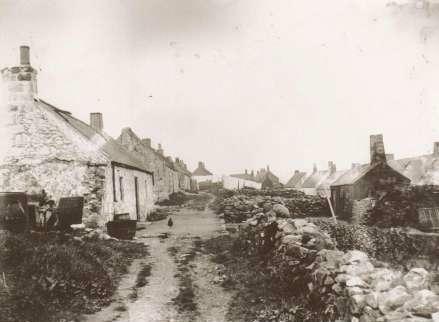 As well as running farms on the estate of Portlethen he was a practical land-surveyor and estate agent, who was employed professionally in the valuation of farms, and the improvement of estates, and was very often cited to give evidence in delicate cases of arbitration in the civil courts. Away from agriculture Walker was an integral part of the community, being a respected kirk elder and a member of the local parochial school boards as they started to gather momentum throughout the 19th century. He was an approachable sort of fellow who, with his honourable dealings and genial nature, earned the respect of lowly farmhands and fisher folk as well as the landed gentry. When he passed away in the 1870’s his farms, lands, businesses were taken over by his son George J. Walker, who had already been heavily involved in farming, land valuation and the local community for many years.